These 10 kitchens are as unique as the celebs who cook–or get cooked for–in them. Click the pics & links to see more of each one and tell us which style you like best! 9. 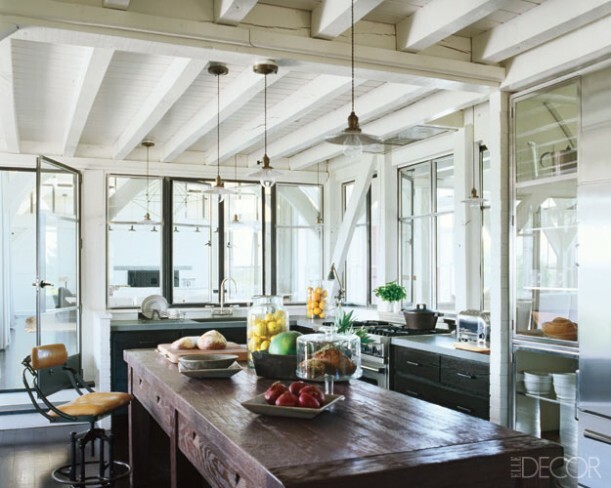 Gwyneth Paltrow’s Kitchen in L.A.
Love Your Kitchen? Show Us! My vote goes to Sharon Osborne. I like all of the light, the colors and that it’s country without being too cute. I like Jennifer Lopez’s, Meg Ryan’s and Renee Zellweger’s as well. Celine Dion’s leaves me cold. It’s just big and showy. I agree with Carrie. My vote goes to Sharon Osborne. I also like Meg Ryan’s, Brooke Shields and Renee Zellweger’s kitchens as well. Lance Armstrong’s kitchen is my fav. Too bad he’s a fake. Jennifer Lopez, Meg Ryan, Renee Zellweger, and Sharon Osborne…..They all have that light and airy vibe. Sharon Osbournes kitchen for sure. When they had their reality show I always checked out the house and loved her style. Yikes. I don’t like any one in its entirety. Either too contrived or too “themey”, done by designers who told the celebs what they ‘should’ have. Each seems very impersonal. I love real kitchens, kitchens that work, or kitchens that drive us crazy but we adore anyway. Kitchens with dishes still in the sink or a puddle on the floor when the dog wouldn’t go out in the rain. You should let us send in OUR photos. Couldn’t have said it better! The celebrity kitchens looked distressingly similar. J.Lo. No contest. I didn’t think we’d share decorating taste. Ha. Julianne Moore’s is my least favorite, hands down. It would be like cooking in a cave. I like Sharon Osborne’s kitchnen the best out of the bunch – surpised that it is so light and cheery. I remember their former kitchen to be dark and more dramatic. I like Jennifer Lopez’s kitchen the best, and Celine Dion’s the least. LOVE Sharon Osbornes Kitchen… the Brits really do many things better! And if you had shown me the pics and said ‘one of these is Celine Dions’ I would have picked it right out… holy over the top! I guess when you got it, you live like ya’ got it! I like Sharon’s and Renee’s kitchens. I love a light and bright kitchen. I didn’t know Sharon had such good taste. Thought she might have skulls and black paint. Renee’s kitchen looks so homey and lovely. My favorite kichen is Jennifer Lopez’s kitchen. I love the blue cabinets, how they are so light and the black stove is so dark, which makes it stand out. Love the airy feel of it. I loooooooove Sharon’s kitchen. I did have a look at the rest of the house and although it’s beautiful, it’s a bit formal and frou frou for my taste. It’s almost like they had a different designer for the kitchen. In my opinion, this kitchen has exactly the right blend of elegance, rusticity and practicality. I always loved Sharon Osborne’s kitchen from the house she had in the reality show. I think my favorite is Meg Ryan’s. I’m a country decorating girl, so Renee’s kitchen immediately jumped out at me – especially those windows and that farmhouse sink! Although Andie’s kitchen has richness and warmth to it. I saw a special on HGTV in which her house was featured and it was gorgeous! 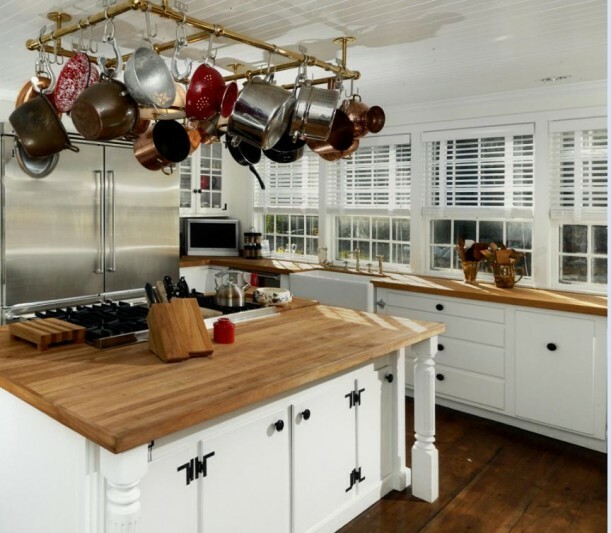 I favorite is Meg Ryan’s with Julianne Moore’s a close second (the cabinets need to be darker.) They’re totally different from one another, but I like the rustic charm of both. Celine Dion’s is so bizarre and over-the-top. It’s like they tried to cram every conceivable feature, multiplied by 10, into that space. Conspicuous consumption again. I love Gwenyth Paltrow’s kitchen! Hate Andie MacDowell’s… sorry. Also like Jlo’s and Osborne’s. Click on the link to Julianne Moore’s kitchen. Check out the hallway photo. It looks as if you could step out of the picture on the wall, onto the bench, and then wipe your feet on the rug. Don’t care too much for the kitchen, but the hallway cracks me up! While I can’t say as I admire his professional ethics, I have to like Mr. Armstrong’s kitchen (#4). It certainly has that “where everybody knows your name” appeal. I’m surprised to say that none of them made me gasp with WANT. (Though Celine Dion’s and Andie Macdowell’s made me gasp with “UGH!”) But I’ll give my vote to J Lo’s. It’s pretty and bright. Love the countertops. I can tell you which one I don’t like. Celine’s is a little much and quite over the top. Meg Ryan and J. Lo have my votes! I think if you had told me one of those was Celine Dion’s I could have picked. Good god, woman, how many freakin’ pots do you need? i like the NY ones best for city kitchens then are clean and look like you could cook up a storm in them with people standing around etc. but if i had a beach house, Meg’s kitchen is lovely! I like Meg’s kitchen and I also like Julianne’s. I just wish that Meg would stick with home renovation and stop renovating her face. She used to be so cute and now with her efforts to look younger she just looks scary. I love Lance Armstrong’s kitchen. It has a great mix of colors and textures; I especially love the industrial lights and the pictures on the ledge. Love it. Homey & comfortable. Oddly enough I think Sharon Osbourne’s kitchen is my favorite. I do like the warmth and layout of Julianne Moore’s, but I prefer brightness and color in a kitchen. 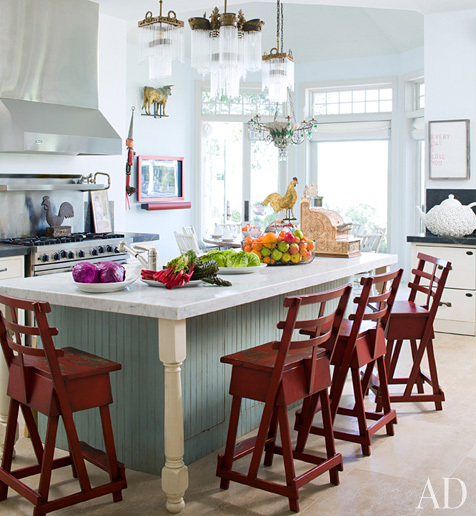 The window’s in Meg’s are great and I like the island in Gwyneth’s and the color and counters in JLo’s. To be honest Celine’s looks a little tacky and kind of your “builder” kitchen materials. I would like a cross between Renee Zellwegers and Jennifer Lopez with a lean towards Renee’s! #2,6,9 are definiteily our favorite! Saw this interesting article about 2013 kitchen trends and reminds me of this post (eieihome.com/blog/5-kitchen-trends-to-watch-for-in-2013.html) still can’t get over how pretty these kitchens are! I’ll take Meg Ryan’s kitchen, with less modern windows and cabinets. Looks like a comfy place to cook and hang out. Wish there were more pictures. Sharon Osborne’s is cute, too. Gwyneth’s looks a little “Spanish Inquistion” and Brooke and Celine – yikes! Lance Armstrong’s kitchen is not my taste but it does look very comfortable. Sharon’s is by far my favorite. Least favorite is Celine’s. Gaudy much?!?! I like my own kitchen better than any of these pictures! But, my second choice would be Gwyneth’s. I think it’s funny that no one is going to like that silly Celine Dion kitchen, considering she probably spent a gazillion dollars on it. I’m partial to the older Hollywood feel of the Lopez kitchen, though I wouldn’t want to make a mess in there. Sharon Osbourne for sure! Love the “at home” look and feel. I don’t care for any of these kitchens, but if I had to pick one, it would be Jennifer Lopez. I like the blue cabinets. Love Sharon Osbornes RED CHAIRS! Those are great! Overall, I think Meg Ryan’s is my favorite. To me, the red chairs ruin Sharon’s kitchen. I like the chairs as chairs, but not in Sharon’s setting. I’d put them more with Renee’s kitchen, if her island had the ability for chairs. I might even put them in Gwyneth’s kitchen as a replacement for the ugly metal and leather chairs. I agree. I didn’t like the chairs at all. They looked like if a child’s potty chair and high chair had a baby, this is what they would look like. Lance and Sharon. Once I saw the other shot of Sharon’s I liked it less though. Think I would need to put shelves up or something on the stove wall it looks unfinished to me. I like Juliannes and Megs. Celines was SO over the top! What is that big gold thing on the left? Pretty to look at but not to live in. None of them seem very comfortable to me, though Sharon O’s comes closest as it just needs few warmer colors and more comfortable stools at the bar. Lance Armstrong’s seems pretty cozy but I don’t like the seating/table area–softer seating and a fireplace would make it great. They all just seem too designed. I like Meg Ryan’s kitchen best, followed by Julianne Moore’s. They’re very different looks, but I happen to like both styles (which is why I really need two houses). I love Meg Ryan’s kitchen en total and also Sharon Osborn’s counter chairs! 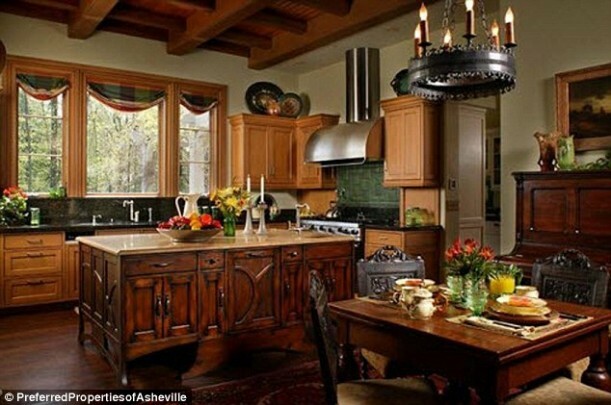 Your post on Andie MacDowell’s North Carolina Tudor home is one of my faves. The kitchen isn’t the best part, but I loved how the rest of the house was warm and welcoming, almost Hobbit-y for a big house, yet managed to be filled with light. There are a butler’s pantry, dining room, and conservatory that are airy to balance things out too. I liked Sharon and Meg’s the best . I loved Brook’s HOME..for that is the feel I got from the pics. A home, not a showcase. One can imagine her girls actually living and playing in that home. Meg’s house was fantastic also..ohhh the view. I can see Meg & Brook actually cooking in their kitchens..the others?… nah not to much, All were lovely tho. Meg! Love her movies, the sets of her movies, and her kitchen, too, evidently. LAST on the list would be Celine’s! She seems wonderful in interviews, but her style is soooooo the opposite of mine. Love J. Lo’s…Celine’s was my least favorite. I am positively drooling over one or two aspects of every kitchen in this post, but I’m reeeallly digging the kitchens of Meg Ryan and Renee Zellweger. Gotta stick with my gut. 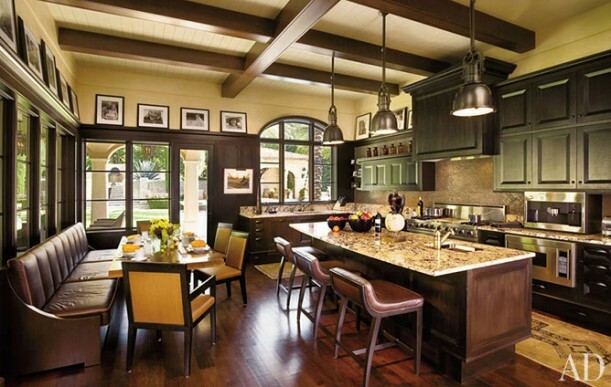 Although I think my husband would vote for Lance Armstrong’s “Pub-Like” kitchen. For sure. None I really really don’t like islands, except in a loft. And farm tables are just islands in sheep’s clothing. Renee Z’s is lovely. While they are all beautiful – I decided today (looking at these photos!) that I don’t like a kitchen that looks like a living room. None of these kitchens look like they’ve been “cooked in” or smell like garlic or coffee! To me some of the “stuff” looks like props – not stuff that is collected and/or used. I love Brooke Shield’s kitchen – swanky, stylish and a little different. Really not keen on Sharon Ousborne’s chairs, it ruins that kitchen for me. Surely Lance’s kitchen is every man’s dream kitchen. And for a holiday home, I love Meg’s. Great selection Julia! I am not enamored of any of these. Most of them look like cookie-cutter expensive kitchens, without any real originality (at least appropriate to kitchens) and I don’t think that most of them would be conducive to cooking. Perhaps these people do a lot more entertaining for large groups, and so need all this, but these kitchens seem out of scale for most people, and I usually like large, spacious rooms. I’m most comfortable with Julianne Moore’s due to the uncluttered look and nothing seems too precious. The materials are durable and easy to care for. But, like others’ have mentioned it has a dark color palette so it would be nice to have some more natural light. I really love Gwyneth Paltrow’s as well. It seems very well equipped and full of personality. I especially love the island where the kids could sit and do homework or get involved in the cooking. But the size of it overwhelms me. A great kitchen for entertaining though! Hi Julia I love Sharon Osbourne’s kitchen but I could spend hours in Meg Ryan’s kitchen it looks so easy on the eye and easy to look after. This was fun thank you for sharing. Regards Esther from Sydney (it’s Spring and the gardens are full of flowers – beautiful) and you guys have all those Autumn colours to enjoy beautiful. I like Sharon Osbourne’s the best, though I’m a bit surprised by that. It feels the most homey and has something of that wonderful British look about it. Second favorite is Meg Ryan’s beach house. I feel I need to stand up for Andie’s, though. It needs to be taken in context. The house is a new Tudor – lots of wood, carved beams, etc. which is fitting for its neighborhood near Biltmore House in Asheville. It’s not only English/Scottish in feel, it’s in the mountains, and you expect a heavier, more woodsy look there. I know because my cabin is not that far from it, though my entire first floor would easily fit in her kitchen/breakfast room! And I think her island is gorgeous – beautiful craftsmanship. Celine Dion’s kitchen is awful ! I’d choose the lifestyle that goes with Meg Ryan’s space. Plunk me down in the center of the room & I’ll take it from there! I do have to wonder if anyone cooks in these kitchens. Not enough storage in many of these. I like Renee’s and Meg’s kitchens the most. As someone said, if I could combine lots of my favorite elements from some of these kitchens, I might have one I really liked. Sharon’s, Meg’s and Renee’s look the homiest. Celine’s is awful, but not surprising. I love Jenny from the block’s kitchen. What on earth was Celine thinking. I love the NYC townhouse/apartment kitchens. I love seeing what people can pull off in a fixed space. Sharon O …hands down. I love all her homes…so inviting and beautful….. I like simple, earthy, a little industrial, and lots of wood. Gwyneth Paltrow was my favorite, although I would eat good food from any kitchen! I like it warm and light, wich can be tricky sometimes. Fun post! I definitely vote for Jennifer Lopez’s. I love the light, bright colors and all of the shiny surfaces. It looks so glamorous and clean! Loved Lance Armstrong’s pub kitchen, very french in feeling. I love Meg Ryans the best…it actually reminds me of some of her movies which I love. I’ve always wanted an apartment that looked like the one she had in “You’ve Got Mai.” I like Lance Armstrong’s as well, its a little too dark and manly for me but I like the banquette against the wall. love that Jennifer Lopez kitchen with those beautiful blue cabinets and that incredible stove. Perfect kitchen to wake up to in sunny California! The stove in JLo’s house has me beyond green with envy – always wanted a La Cornue stove!!! I think I am going to go with Meg Ryan’s Kitchen! !